From November 15 - 18, 2016 the Eurotier exhibition took place in Hanover, Germany. Eurotier is the world’s leading trade fair for animal production. In total 2,360 companies exhibited and 156,000 visitors including some 30,000 international visitors came to the event. The new Bovans branding was revealed at the new Hendrix Genetics booth featuring their poultry activities as well as the new One Hendrix Genetics branding. Design elements in the new house style was featured in the booth display. On November 16, Hendrix Genetics invited 250 customers and friends from the poultry and pig industry to the booth for a hospitality event. 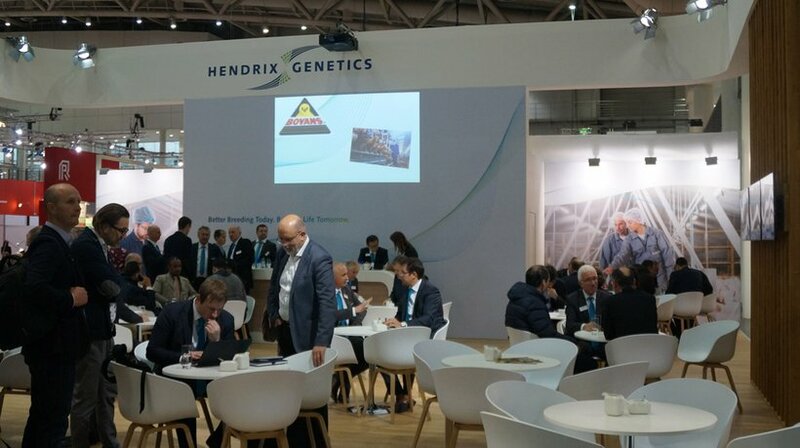 In a short presentation Antoon van den Berg, the CEO of Hendrix Genetics, spoke on the decision to merge the strength of all individual companies into One Hendrix Genetics. He also shared some key highlights of the future plans and goals for Hendrix Genetics.